VARIOUS MFB EVENTS HAPPENING AROUND YOU ALL. Our Little “LORD” arranged for a meet with Dada during the shooting of Bengali hit sequel titled “MINISTER FATA KESHTO” a sequel to super duper hit “MLA PHATA KESHTO”. The sooner LORD informed me about our meet , I picked up the little master LORD and master of love ROMEO on the way and rushed to the studio where the shoot was on. Lo’ Dada was waiting for us eagerly to hear about our most futuristic “MITHUN FRIENDSHIP BRIDGE”. We showed him the print outs of my interview with Ruhul Amin and few of Dada’s Award Winning pics of Stardust forwarded to all members around the Globe. We were with Dada for almost 30 minutes. 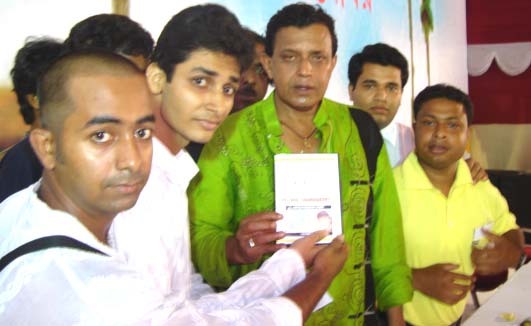 We showed him photos of Roopan,Jeet,Kaushik,Lord,Romeo,Self,Ruhul and others. He was highly impressed with our hard work put in to promote his amazing work done day in and day out. He even called all his fellow members and spoke high of “MFB” and its duty bound work done. He even requested few fans of his to register themselves as members of “MFB”. He had assured his 100% support and help to grow “MFB” to dizzy height in days to come. Dada also requested us to meet him every time he visits Kolkata and brief him about our present activities. 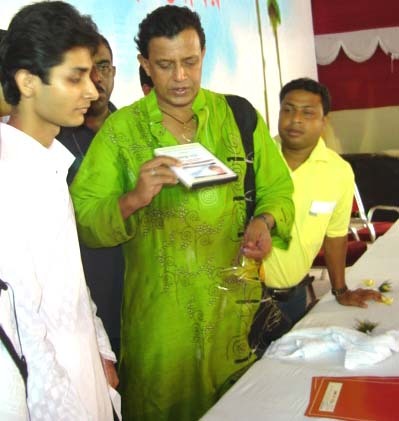 He had invited us to meet him on 9th when he will be in Kolkata for Rabindranath Tagore statue opening ceremony. YES, we can now say proudly that “MFB” has got its recognition from our most affectionate Dada. He also wanted us to collect every members PHOTO for him to look at it during his next visit to Kolkata. We showed him every thing through a CD brought by Little Lord through my Laptop. We discussed with him about all our members , he got excited by knowing that we are too closely connected to indefatigable RUHUL AMIN and ROOPAN NARAYANAN whom he knows very closely. He intern asked us how you meet Ruhul Amin ?. We confirmed that we are too close to Ruhul and he had even visited our house and occasionally we visit his hotel and have some joyful moments together. This was amazing news for him. He also spoke too high about Roopan Narayanan of Trivandrum as he is very very close to his family . With everything falling in place, we expect “MFB” to take a high jump and register innumerable members of Kolkata also few around the Globe to be deidicated 100% to our beloved Dada. Our dear Dada also requested us to inform him if we face any problem so that he can render his help. We therefore request every “MFB” member to mail us their respective photos so that we can show him in his hotel room during his next visit to Kolkata on 9th April 2007. We thank Almighty for all that he had done to us and “MFB”. During our discussion we also talked about our female members like Xenia and Bhavna and he was amazed to hear this from us. We wish Ruhul Amin communicates this message to XENIA one of our most intelligent members with whom we are not in touch now a days.The proverb “BAGHWAN KE GHAR MEIN DER HAIN MAGAR ANDHER NAHIN HAI” does aptly suit to the situation. It took us almost 2 years to get close to Dada . He even gave us MIMO’s mobile number when we said that his number has changed. As it is better late than never, we expect good response from our beloved members around Globe.We three came out of the meeting room highly motivated to do more and more hard work to promote Dada’s good work and also popularize his films around the globe. With no comments or advise for any of our forward, we at least expect some response for this mail at least to satisfy our living LEGEND DADA. Today is a day to be remembered for decades to come. We are attaching four photographs taken during our meeting today. Kindly acknowledge receipt. Full marks need to be given to Little Lord and Little Romeo for making the meeting a GRAND SUCCESS. FROM NOW ON U CAN SEE OUR NEW WEBSITE MFB TV BY CLICKING ON THIS URL. video clips in this website.